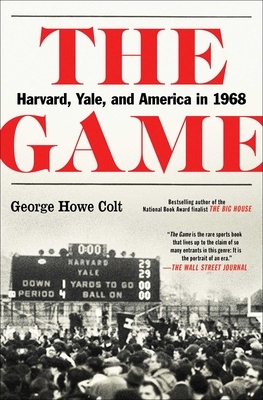 From the bestselling National Book Award finalist and author of The Big House comes “a well-blended narrative packed with top-notch reporting and relevance for our own time” (The Boston Globe) about the young athletes who battled in the legendary Harvard-Yale football game of 1968 amidst the sweeping currents of one of the most transformative years in American history. "Colt’s recounting of this significant college game also resounds with significant cultural commentary on a tumultuous period. It’s a well-blended narrative packed with top-notch reporting and even relevance for our own time." "A fascinating look at a famous game and a turbulent year in America." "There's no doubt that football fans will find The Game fascinating — Colt understands the nuances of the sport, and he writes about it with an enthusiasm that never descends into rah-rah fandom. But you don't have to be a sports fan to enjoy the book; like Buzz Bissinger's Friday Night Lights, its human focus makes it accessible to everyone, even if you don't know the difference between a touchback and a touchdown. Vibrant, energetic and beautifully structured, The Game is a big-time winner." "A richly detailed, engaging story... First-rate reporting and writing that will appeal to gridiron fans and general readers as well." "By humanizing the players, the accounts of each team's amazing season and the four-chapter recap of their final, unbelievable game are elevated above entertaining sports reporting to thoughtful, emotional storytelling. This excellent history illustrates sport's powerful role in American society."